​Last year this day Chennai was flooded. But that is not what this post is all about. Last year; when S turned a sweet half century, we – me and the girls, wanted to do something different for him. Actually I had planned on blogging about it too. 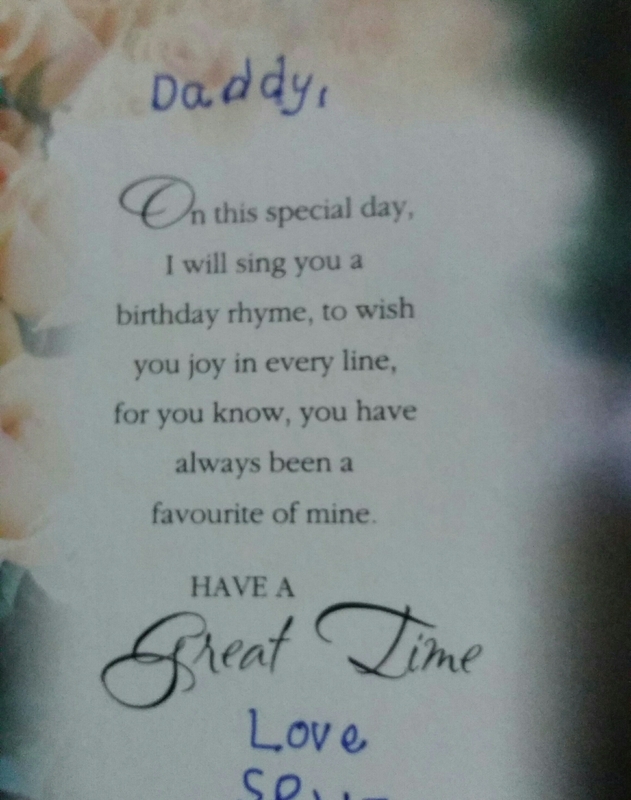 We asked 50 people – close friends and dear relatives to write a birthday message to him. We had planned to print and courier the same to him. So it’ll be a damn neat surprise when he opens up a parcel to see 50 msgs inside for him. Nature has its own ways. Courier plans were changed last minute. I took it on me to take th print out and seal the individual msgs in envelopes. I remember running dripping wet with a plastic folder with printed msgs literally plastered under my higging hands. But there was no power since 1st evening. With a hand held torch, I managed to do the envelopes so that I could give S his 50 bday wishes when the clock stuck 12. And he too had to read them all in that torch light. The point is what we planned as a great bday gift became the only wish he got as the phone networks were all gone for a hit for nearly a week and after that the birthday was forgotten. Luckily, everyone of them had their wish in writing much earlier than possible to the bday boy. On the whole, its something to hold on forever. And I found a treasure trove in my shelf yday. This one from the girls in their baby handwriting datex 2K is probably something he’ll cherish always. Here’s wishing my man yet another great year where he is his happiest ever! Happy birthday to your hubby and you will make his day more special uma. That’s a wonderful idea uma, getting 50 messages on 50th birthday. Wishes will be passed on duly 🙂 Thank you! Anyway all that’s behind now! The rain managed to make his birthday more special than you planned. Neat idea…loved it!! Handwritten notes are most special always. Indeed those hand written notes are cherished and read again ! Many many happy returns of the day.. wishing S a very happy birthday..
That’s a great idea, Ums! Happy birthday to your man! And many many more to come. And once more, the Happy Birthday song must be sung!